If you’ve seen photos of Meteora, I’m sure you need no convincing that taking a Meteora tour from Thessaloniki is an essential day trip. 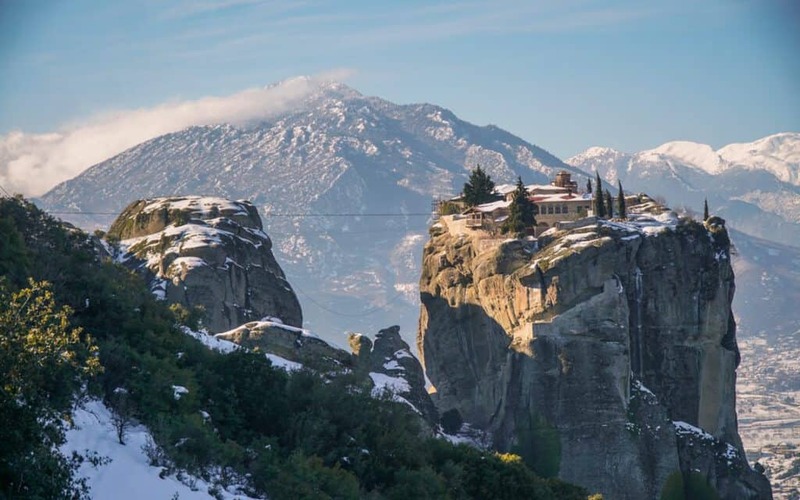 There are a handful of ways to handle a Meteora tour from Thessaloniki: going on a guided tour, renting a car and driving yourself, or going via public transportation. Each way comes with its own pros and cons and surprises. In fact, believe it or not, it is actually cheaper to go on a guided tour of Meteora from Thessaloniki than to DIY a day trip there using public transportation. 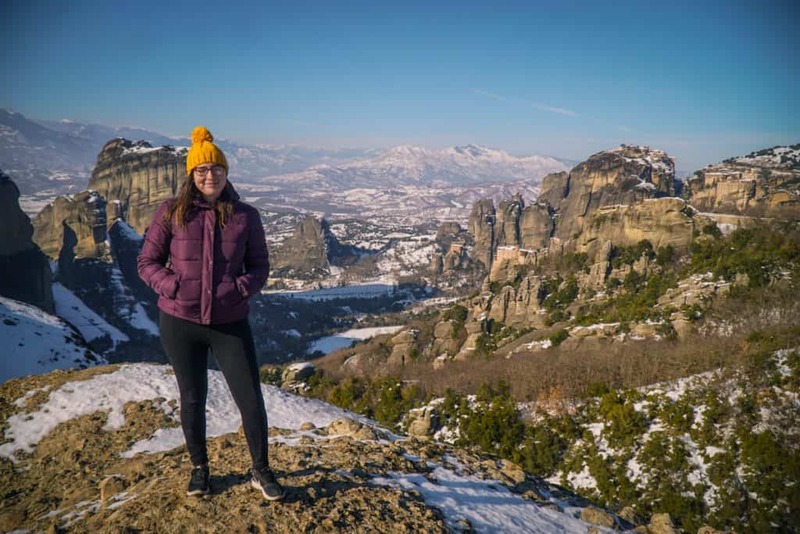 Below, I’ll go over the three main ways you can arrange a Meteora day trip from Thessaloniki, although the only one I have firsthand experience with is taking a guided tour. The rest are my best guesses from research. If you’ve done it any other way, please share your experience in the comments below! This is by far the easiest option and it actually shakes out to be less expensive than taking the train to Thessaloniki for some reason! The train itself from Thessaloniki to Meteora is around 29 euros – so double that, and you’ll see that do save money by taking the guided tour (and that’s not even factoring in the transportation around Meteora – that’s just literally getting you in between Meteora and Kalambaka). I went with Ammon Express and it cost 55 euros round trip. Monastery fees (3 euros per monastery so a total of 6 euros), lunch, souvenirs, and extras like coffee are not included in the price. 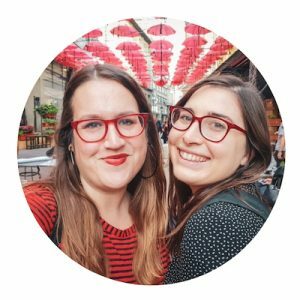 This is the exact tour I took, so you can read reviews (including my own!) here. Here’s a basic rundown of how the day goes. Ammon Express has five pick-up spots in Thessaloniki, running roughly in a straight line through the most touristic part of the city. You pick the pick-up spot that is closest to you and meet them there. Be sure to show up a few minutes early. I met them at Aristotelous Square at 8:15 and sure enough, they were about 5 minutes early. So show up early as they have to pull over and park and they don’t have an officially designated spot – you don’t want your lateness to get them in trouble, or to make other people further down the line wait! We drove for an hour and a half and made a stop at a small café / rest area for about 20 minutes, where I grabbed breakfast and a cappuccino and used the restroom. We then continued onwards another one and a half hours to Meteora. 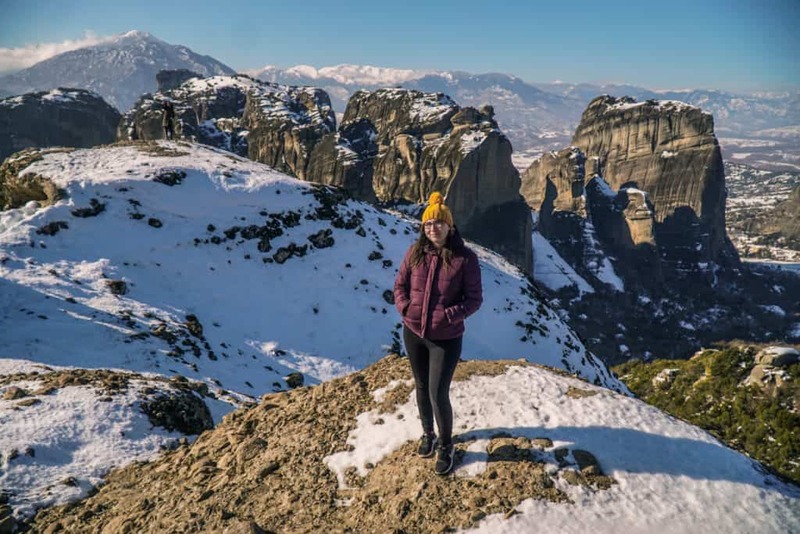 First, we stopped at the classic viewpoint of Meteora, the one you’ve seen in all the photos, Holy Trinity Monastery, perched in isolation atop one of the most beautiful rock pillars in the entire plateau of Meteora. Keep in mind that the monasteries you visit on your tour will depend on the opening hours of each monastery. 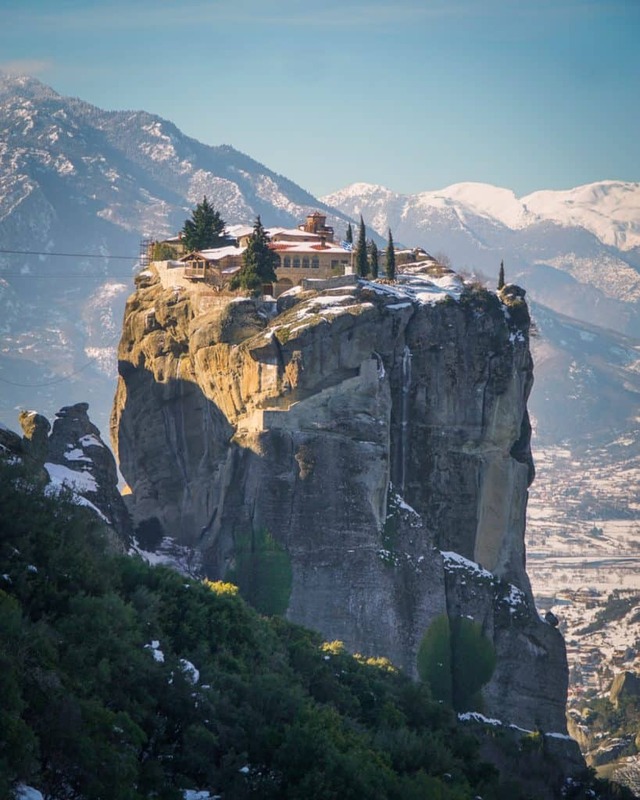 They are only open a few days a week so if you have your heart set on seeing a specific monastery, do the research when booking your Meteora tour to ensure that it’s open on the day of our tour, and possibly reach out to your tour company to see if that’s one of the included tours. We were supposed to see St. Stephen’s Monastery, a functioning nunnery; however, despite the schedule indicating it was supposed to be open that day, it was closed. Therefore, instead, we saw Varlaam Monastery and Great Meteoron, the second and first largest monasteries in Meteora respectively. But on the way, we stopped again at another fantastic viewpoint for photos! Our guide at Ammon Tours was not able to come in with us into the monasteries. This is because he is not specifically licensed to be a guide in Meteora proper, which is highly regulated and in limited numbers. Our guide was able to give you plenty of explanation as he drives you around the monastery and direct us to what we should look out for, though, which was plenty for me. In fact, I actually preferred this. Often, when taking a guided tour, I feel rather trapped by the confines of the tour and sticking with the group. As a blogger, I need to prioritize getting a lot of photos first, as it’s much easier to research the history online or in books later than it is to come back and get photos. I liked that I had free time to roam and photograph without feeling rude for ignoring my guide. However, if you are a history geek who wants every bit of the buildings you’re seeing explained, a different kind of tour may be a better fit. We had about 45 minutes at Varlaam Monastery and about an hour at Great Meteoron. For me, this was the perfect amount of time to allocate for each and climb their many stairs, gather photos, pet the friendly monastery cats, shop for souvenirs, and see the churches and museums inside each monastery complex. After seeing both monasteries, which is done early in the day as in general, the monasteries close around two, it was time for lunch. We were a small group of three so our guide let us choose what to do for lunch; we chose to do our own thing in Kalambaka instead of having a big lunch in Kastraki. I had a delicious gyro for just a few euros in the town of Kalambaka and went for a small walk in the city. However, keep in mind that I went in January and there were three people on my tour including myself. You likely won’t have this option in the peak season, when the tour group is larger and therefore needs to be more structured. After lunch, it was back to Thessaloniki! We made the same coffee/bathroom break about 1.5 hours in and then continued back into the city. Since we were a small group and able to travel quickly, we got back around 5 PM having seen and done everything. However, in the summer or when traveling with a large group, you may get back closer to 6 PM or even 7 PM. It takes time to wrangle groups – especially when stairs are involved – and sit down for a multi-person lunch. All in all, I highly recommended my Meteora tour from Thessaloniki and hands down found it the easiest, most rewarding way to visit this UNESCO World Heritage sight in a single day. A big shout out to the awesome Giorgios who shared his passion and wisdom with us, and whose goodwill and flexibility made our Meteora tour even better. Sounds like the right tour to you? Click here to see prices, reviews, and make a booking here. Note that if you can book online, there’s no need to print – simply show your voucher on the mobile app. Gotta love technology these days! If you rent a car, there is no reason why you can’t visit Meteora from Thessaloniki quite easily on a day trip. 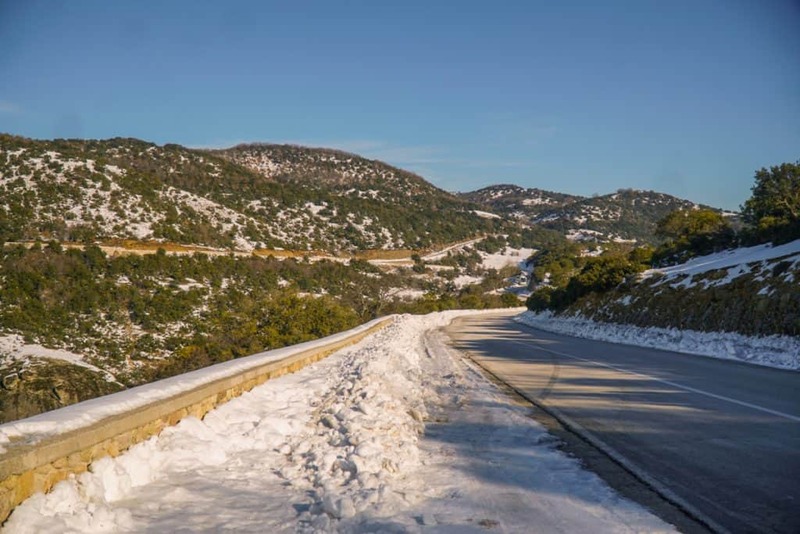 The roads between Thessaloniki and Meteora are excellent, although long – it takes about 3 hours point to point. I have no experience with renting a car in Greece yet but I don’t see why it would be more difficult than driving elsewhere in the Balkans. Greek drivers can be slightly fast but not particularly aggressive or careless. However, if you travel in winter, be careful and watch the weather reports. 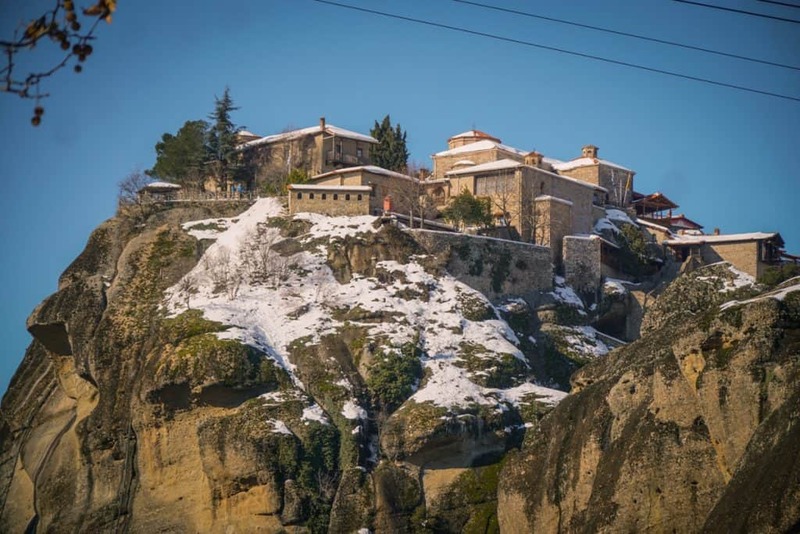 There had been a big snow storm a few days before I went to Meteora that made many of the roads very dangerous. A few days later, they cleared it and it was perfectly fine to drive, so just check the weather and be cautious. I did notice that we passed several toll booths on our way to Meteora but neglected to notice exactly how much we were paying each time, so do remember that you will be using a number of toll roads that may end up adding up on your Meteora day trip. Looking briefly at car rental prices, you can get it as low as 15 euros for a manual car picking up at Thessaloniki Airport. Automatic cars start around 25 euros. There are some options to pick up in Thessaloniki city center but you’ll have to ask around to find the best rental company in the city center – it’s not something I’ve tried yet. Don’t forget to factor in gas! At present, gas costs about 1.50 euros per liter, so that can add up to your road trip costs. As Thessaloniki to Meteora and back is nearly 500 km, I’d estimate you will pay about 60 euros of gas. Of course, that is purely my best guess and will vary depending on what car you drive and its fuel efficiency, how you drive, weather conditions, etc. So when totaling up costs, remember that you’ll have to get to Thessaloniki airport if you’re not starting your trip there, plus the rental car and any insurance you buy, gas, and tolls. All in all, I’d say 120-150 euros is a good estimate for how much the trip will take. So if you are traveling in a large group such as 4-5 people, it may likely end up cheaper than taking a day tour. On the other hand, if you are traveling in a couple or solo, it is definitely cheaper to take the tour I mentioned above. 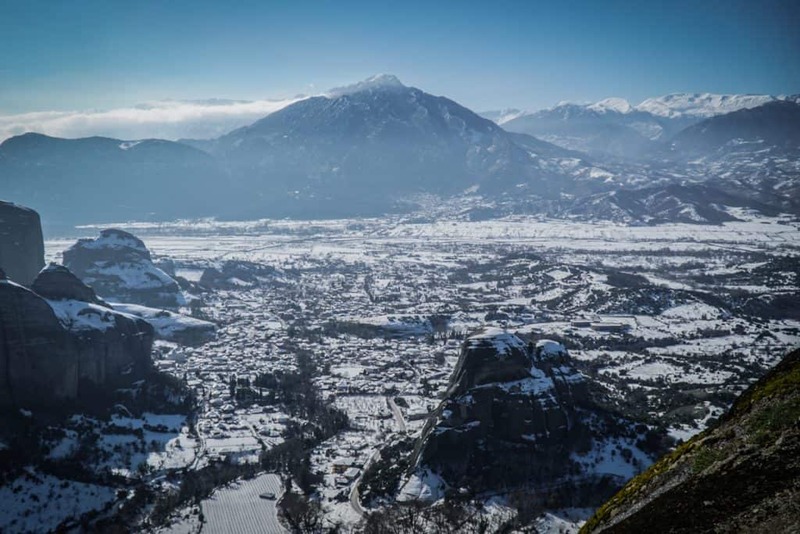 If you do your own tour, get an early start as most monasteries close at 2 PM in winter. In the summer, most close around 4 PM. Do your research and pick the monasteries you want to visit and their opening hours, remembering that many are closed on specific days of the week. In general, Sunday is a good day to go when most of the monasteries are open. Normally, the best advice for budget travelers is to scrap the group tour and DIY it using public transportation. Unfortunately, that’s actually not the best option for Meteora. The Greek train website is a bit of a nightmare to use, but from what I could find, it cost 29 euros to travel to the nearby town of Kalambaka from Thessaloniki via public transportation. If you buy a return ticket, you can reduce the price a bit – I saw some return tickets for about 15 euros, and others for around 25. Furthermore, that just gets you to Kalambaka. 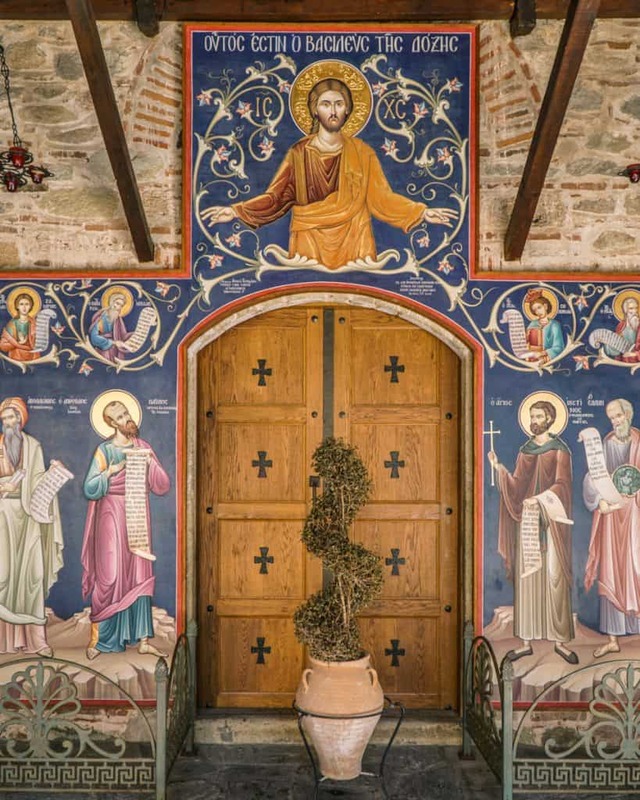 From there, you will either need to hire a guided tour from Kalambaka or hire a taxi to take you around Meteora, as the monasteries are not walking distance from the Kalambaka train station. That down there is Kalambaka, as viewed from Great Meteoron. Not exactly walking distance, is it? 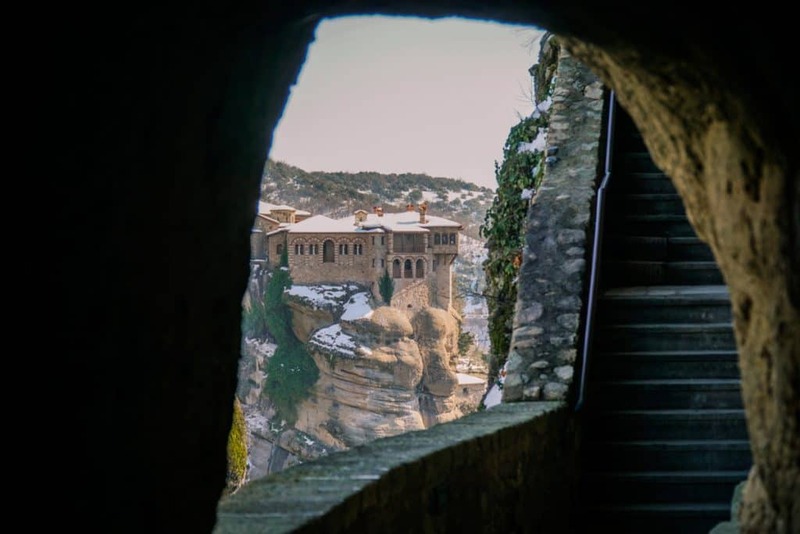 I’d only recommend doing this option if you plan to stay several days in Kalambaka, seeing all the monasteries at a leisurely pace and enjoying the area around Meteora. If you simply want to do a day trip, a shuttle and tour service is the better and cheaper option. Whatever way you plan your Meteora trip from Thessaloniki, one thing is for sure – you’ll be glad you did it. Nothing can compare to the magic of seeing this UNESCO World Heritage Site, one of the most unique I’ve seen in the world, for itself. Here are a few things to know before coming to Greece. First, you can read our article on planning a trip to Greece to make sure you’ve thought about each of the travel planning steps on our eleven-point checklist. Second, if you’re planning to explore the islands as part of your trip here, we have recommendations in our Greek Island Hopping Guide and our Greek Destinations Guide. If you’re interested in the most romantic spots in Greece, we’ve narrowed the list down to our favorite Greek honeymoon spots. Finally, make sure you always travel to Greece or anywhere in Europe with a valid travel insurance policy. Greece is a very safe place to travel, but accidents and theft can easily ruin your trip if you don’t have the travel insurance coverage to recover the losses. Recently my aunt fell on a train in France and needed surgery, but luckily her travel insurance covered the costs in full. Thank goodness!